It was miserable weather in the garden this past Sunday. It was 68 degrees F – but rained on us as we worked all afternoon into the dark. By the next morning, it was in the 20s, and the cold did not let up all day. I finished each day trying to cover plants with agri-bond floating row cover and plastic. A lot of it on Monday was frozen with ice from the rain the day before. It finally got too dark to see again this second day, and I quit. Each night, I prayed our vegetables would survive the plunging temperatures and survive to sustain our supporters and our farm. For me at Scotch Hill, however, the strangest, most challenging part of any harvest in any kind of weather is dealing with our Jack Russell. My happiest times in life have come when work, friendships and love were in balance. Of all the types of work I’ve done in 58 years of life, farming has given the most joyful rewards. Friends whom Dela and I’ve made through our gardens and fields have often proven to be our truest friends. And my heart is full of love for all of life when I can touch soil, seed, plant, bird, animal and feel their response to my service and protection. Being a friend to a farm, is being a friend to the Earth. You – our subscribers – are our farm's best friends. Scotch Hill Farm does not exist without you and your support. 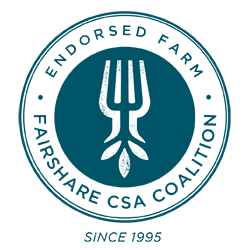 Fifty acres we rent to rotate field crops with our vegetables would quite possibly not be certified organic without your support. Tony and Dela could not own and operate this farm without your support. Together, for at least 6 or 7 months out of a year, we know where our next meal is coming from. This - community supported agriculture - is what food security looks like. Together, we know that we spend our money locally, justly, ecologically.